For a gluten free, vegan, quick, and healthy one pot weekday dinner! 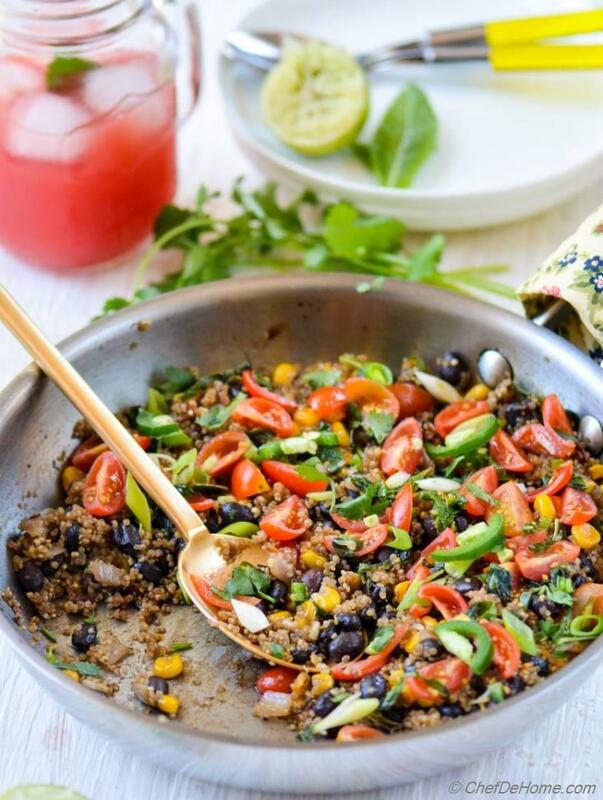 A great skillet to make for weekday dinner that is packed with ton of flavor from chipotle, beans, sweet corn, spices, hearty and healthy quinoa, topped with quick and juicy mint-tomatoes and lime salsa. Does this sound like a scrumptious weekday dinner or what? To me, it's even great for yummy, filling, and mouthwatering lunch! 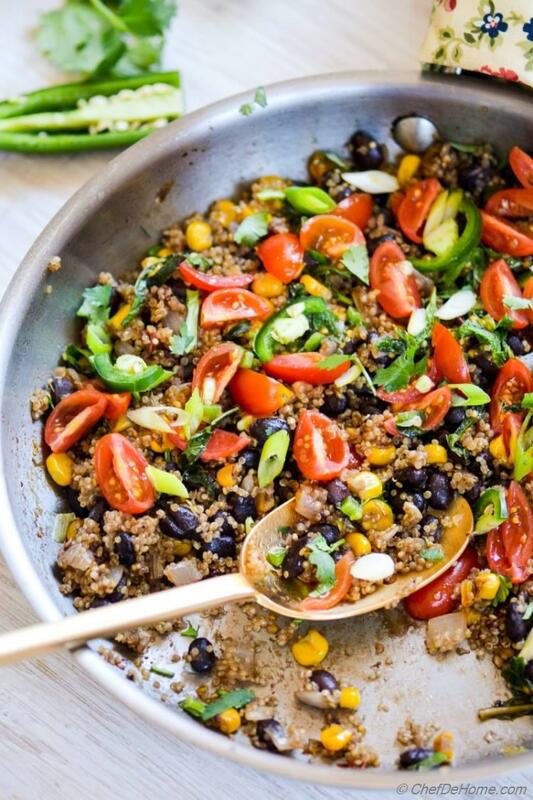 The key ingredient in this Quinoa Skillet is Chipotle in Adobo. One of my favorite Mexican chili. I can't imagine cooking Mexican or Southwest inspired food without it. You know my love for, my darling herb, oregano! Chipotle has surpassed that! The smoky taste of chipotle adds so much flavor to a dish that you don't really need a lot of other flavor-boosting ingredients! 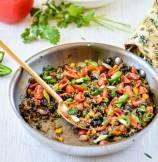 In this skillet, a little heat of chipotle brings together flavor of hearty beans, quinoa, sweet corn, and fresh tomato salsa. Not just looks, it sounds scrumptious too!! Mexican cuisine is not JUST my favorite for nothing! A perfect "bean and rice skillet dinner" calls for flavor packed in one skillet, with nutrition and health, to keep family healthy and happy. And this skillet has all these qualities. 1. The base quinoa is healthy grain. It is full of potassium and fiber and is also gluten free. 2. There is hearty serving of beans and corn for a filling dinner which means no mid-night cravings. 3. Zippy mint and tomato salsa adds a punch of fresh flavor and makes you keep going back for another bite. 4. 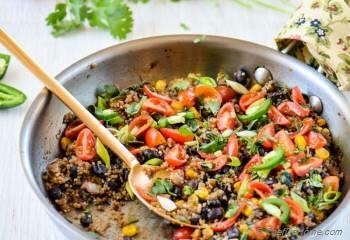 Above all, this whole skillet is ready in just 25 minutes and is VEGAN! 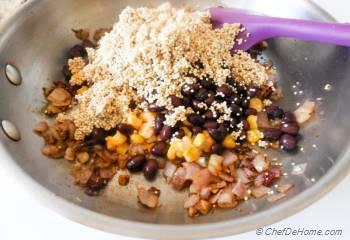 This recipe is inspired from famous, Southwest Skillet Beans and Rice, dinner. To make even healthier, I decided to use quinoa instead of rice. Hence, I'm sure you guessed it! He said: anhhh... umhhh... I don't think we need to replace rice with quinoa. We already boil and drain excess water from rice to make'em lite and less starchy. Yes! We do boil and drain excess water from our everyday rice to get rid of excess starch. (so sorry all culinary gurus!) But, I was not talking about, not eating rice no more. I just wanted him to try quinoa :) So, I dropped the idea.... and learned a lesson. After a few months, I spotted quinoa in Costco and bought a pack home (simply sneaked it into the shopping cart ;)). I cooked quinoa and amazingly, he liked it! Ever since.... I have never stopped using it in salads, skillets, soups... you name it! Costco pack was anyways really big enough to fuel my inital creativity. However, these days, we both love quinoa. In-fact, there are few quinoa dishes (including this zippy skillet) which he specially asks for dinner/lunch. 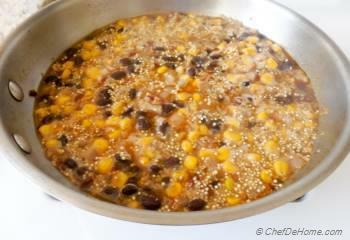 Often, I soak dried beans overnight and pressure cook'em for this quinoa and beans skillet. Indian-style Bean and Rice (called Rajma Chawal) are very common in my home. With help of pressure cooker, most pre-soaked beans from kidney-beans to Chickpeas, can be cooked under 10 minutes. So, I never find it bothersome to make this skillet for lunch or dinner using beans from scratch. In this recipe, however, I have mentioned to use canned beans. If you have time to cook, I would say, home cooked fresh beans taste much better than canned version. If in hurry, canned beans will work fine. Just remember to rinse canned beans before using. These days, this quinoa and beans skillet has made it's place up-the-chart in my weekday menu. Since sun shines little too bright, here, in California! So, easy, healthy, and quick skillets are my favorite for weekday dinner. You know, less standing in feeling-like-oven-kitchen and yet healthy dinner in no-time! Specially, days when we don't eat meat, this one is our favorite! I'm sure you will enjoy it as much we do! These Quinoa or Rice Bowls are my favorite these days! Total Time 25 minutes Prep Time 10 minutes Cook Time 15 minutes Difficulty Easy Yields 4-5 Cups Serves 4 Notes Servings vary based on serving size! Smart Swap Can't find quinoa? Use long-grain rice or millet instead. 1. 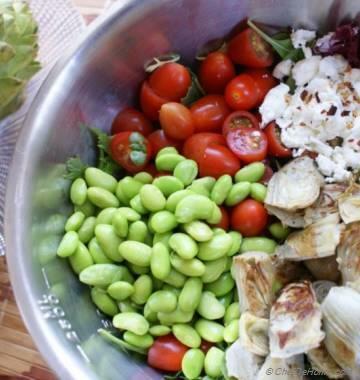 Mint and Tomato Salsa - In a small bowl, add mint, sliced cherry tomatoes, 1 tbsp olive oil, lime juice, scallion and mix well. Add a generous pinch of salt and black pepper and set aside. 2. Heat 1 tablespoon oil in a wide skillet. 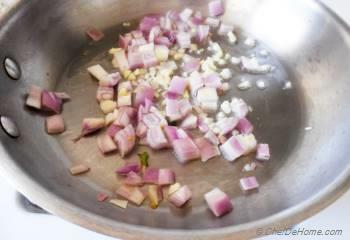 Add diced shallot (or red onion if using) with garlic and saute until onion are soft (3-4 minutes). 3. 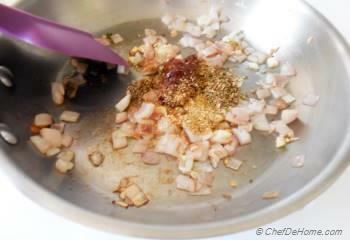 Add all dried spices along with minced chipotle in adobo. Stir and cook for 30 seconds. 4. 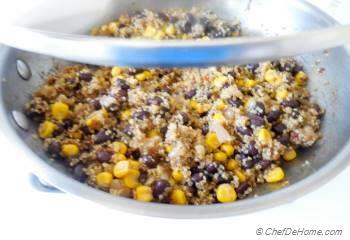 Now add, rinsed beans, rinsed frozen corn, rinsed quinoa with 1/2 teaspoon of salt. 5. Combine everything, then add 1.5 cups of water. Bring to rolling boil and then cover and cook on medium heat until all water has been absorbed and quinoa is tender (about 12 minutes). 6. Once cooked, fluff the quinoa with fork. Cover and set aside for 5 minutes. 7. Before serving, top the quinoa with mint-tomato salsa along with any juices remaining in the salsa bowl. Garnish with sliced jalapeno, avocado, scallions, and cilantro (if you prefer). Serve family-style and enjoy! Chipotle in adobo is a spicy Mexican chili in sauce and has good spice in it. I highly recommend starting with less and then, adding more if need be. I LOVE chipotles in adobe sauce. This dish looks amazing!! 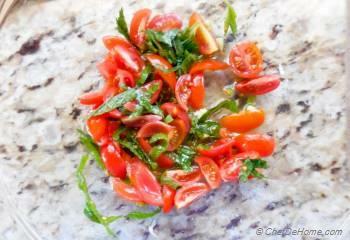 Mint salsa...yum!! Connie, thanks :) Mint Salsa is certainly very delicious! I adore quinoa, any which way it's made, but I especially love your mint and tomato salsa! So fresh, nutritious and delicious! Annie, thanks my friend. I agree, quinoa can taste good in anything. Salsa makes this quinoa even more special. Linda, I'm glad you like it, my friend! thanks for stopping by! This looks amazing! Love the colors!! Ami, thanks! Trust me, colors of this salsa are my fav too :) Happy to see you stop by! Oh what a pretty dish, Savita! 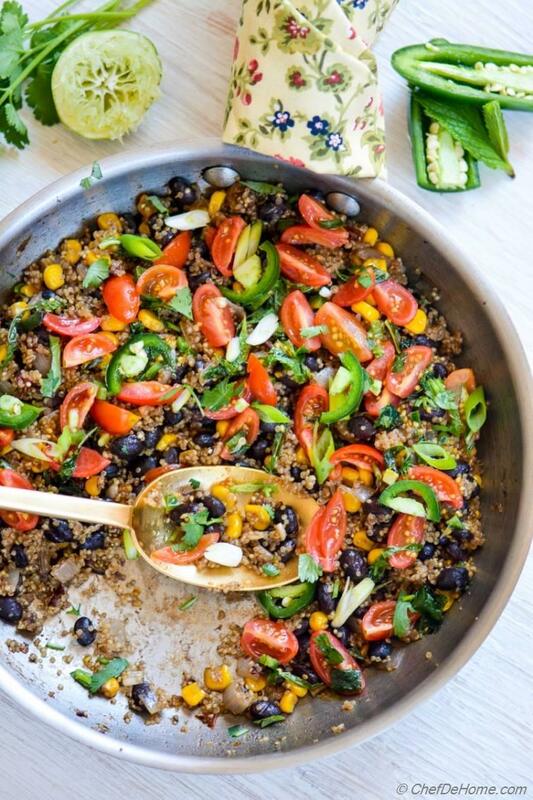 I love anything with quinoa and this looks so full of flavor. Love the mint in here, too! Gayle, thanks! quinoa and mint salsa are kickers in this dish. YUM!! This looks amazing!! 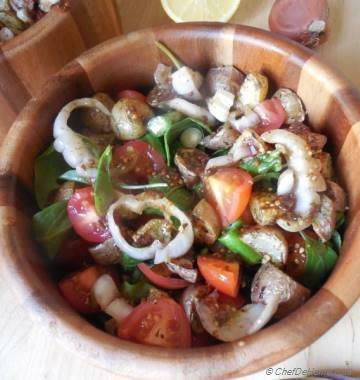 What a healthy, nourishing, delicious recipe!! It looks so delicious!! Beautiful pictures!! Anu, you have found "the zest" of this dish! true girl! 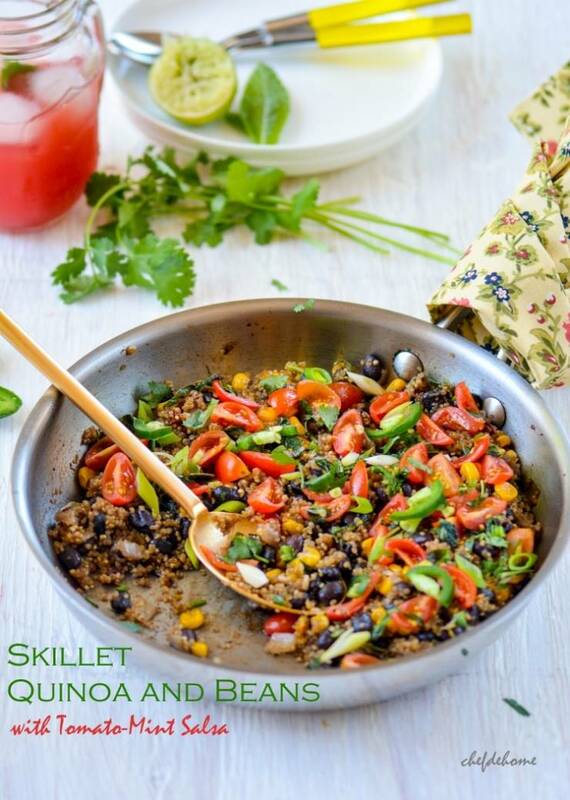 salsa makes this quinoa skillet killer tasty! This dish is looking super delicious. I was searching the recipe of quinoa last few days, now I got, will definitely try this one. It sounds really yummy. Rachna, i'm telling you this qunioa skillet is one delicious meal! and that salsa will make you cook it again and again! Do try! I'm certain you gonna love it! I'm a recent fan of quinoa and am always looking for new ways to fix it. I love all the color going on here and I'm all about one skillet meals. I got that big Costco pack of quinoa too and I'm almost out! Quinoa is one delicious and healthy grain! I'm addicted to it's texture too! You know, that costco pack was way too big for two of us, yet I managed to finish it too :) and ended up loving quinoa even more! What a great way to use quinoa. I am loving all the colours in this. Pinning to make it as soon as I can! Love quinoa! And the flavors in this dish are amazing! I'm sure my family will love it! Mira, our love for quinoa is certainly mutual! Thanks for pin girl! You rock! Yes yes YES! It's everything one can ask for in a meal and more. Delicious, super healthy, filling, looks so attractive too. I must try this Savita. Superb pictures too! Anu, thank you soo much for compliments! I'm sure you gonna love this qunioa! Do try! That's one healthy meal, love the addition of Salsa! yum! Pinned of course! 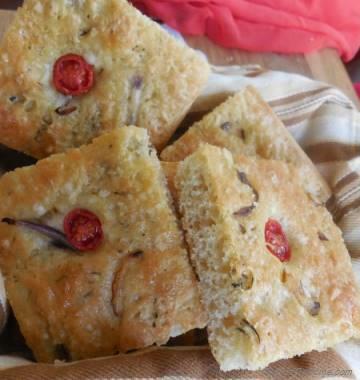 It sure is healthy and tasty too :) Manali, thanks for pin girl and many thanks for stopping by!